If you need to ship your art work, heavy duty art shipping crates may be the solution you need to provide maximum protection for your finest art pieces. For over 35 year we have been crating and shipping art work to all parts of the world. Our clients range from auction house, royal families and private collectors. Regardless of the size and scale of your shipping needs, we will provide you with a professional solution. Our art shipping crates have several different components and layers to them. The configuration of these components and layers depends on the type of the art that you are trying to ship. The outermost layer provides the first level of protection, and is designed to block or deflect the initial blow should something strike the crate. This outer shell is almost always made out of a combination between wood and plywood, around the plywood is a wooden skeleton brace that given an added level of structure and support. 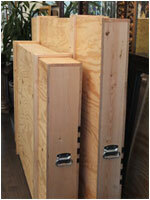 Our art shipping crates will feature soft internal foam or shock absorbent material inserts of various sizes. These inserts protect art by surrounding the art with cushion that can absorb the shock of a blow to the external shell, or in the event that the crate is accidentally dropped. © 2013 New Yorker Picture Frames, New York, NY. Site by New York Website Design.